Cisco has announced that UCS Director will ascend into the cloud as part of a new infrastructure management service named “Intersight”. Due to launch in Q4, 2017, Intersight is the product spawned by Cisco's "Starship" server management project and will eventually gain all of UCS Director's and UCS Central's features. 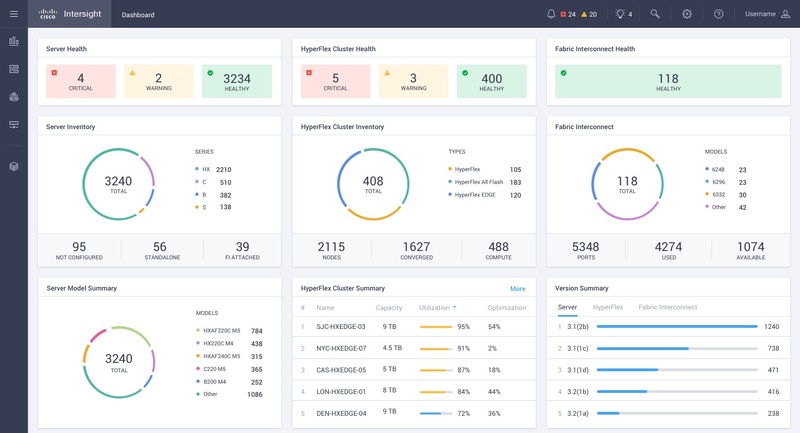 For starters there will be a “Base Edition” that does system monitoring, collects inventories of infrastructure, allows deployment of HyperFlex clusters and drives UCS Manager, IMC and HyperFlex Connect element managers. An “Essentials Edition” will add policy-based configuration with service profiles, firmware management with scheduled updates, plus a service that refers to Cisco's Hardware Compatibility Listing, makes sure infrastructure complies with the latest version and drives automated upgrade recommendations. The service relies on an “open connector”, a small piece of software resident on UCS servers and, Cisco hopes, eventually on hardware from partners like Pure Storage and NetApp so Intersight can drive its converged and hyperconverged kit. The connector uses two-factor authentication to connect a device to the Intersight cloud, which can then reach out and touch it. The open connector is already present on fifth-generation UCS kit and can be retrofitted to fourth-gen boxes. Intersight's other important bit is that it offers a new API, unifying a few that Cisco currently offers for hardware management. This time around the API will let tools such as Puppet, Chef, Ansible and PowerShell drive Cisco infrastructure, so that DevOps types can do their policy-driven infrastructure as code thing. Cisco will collect telemetry from Intersight users' infrastructure, to analyse trends across a fleet of servers and storage, then apply machine learning to predict failures and/or suggest tweaks to configurations or advise when new capacity will be needed. The service will start at US$12.49/month per physical server. Intersight already has some features that UCS Director and UCS Central don't possess today, but isn't ready to replace them either. Cisco therefore plans to replicate UCS Director's features into Intersight over the next two years. There's no planned death day for the on-prem management tools, but customers will be encouraged to adopt Intersight instead. A version of Intersight for service providers will help things along. Even users with unusual security sensitivity will be steered towards a private cloud version Intersight that conduct periodic downloads of useful information rather than connecting to the cloud full time. Todd Brannon, Cisco's director of product marketing for Unified Computing, told The Register that Intersight is unashamedly part of Cisco's plan to sell more software subscriptions. He added that customers want to shop this way, both to move from capex to opex and to access non-disruptive upgrades to management services that it's possible to access from the cloud but hard to adopt on-premises. Brannon also pointed out that Cisco's not new to this game, as Meraki already manages over one million Wi-Fi networks from the cloud. The Intersight team has examined how Meraki's team operates and borrowed the relevant practices and policies all the way down to restrictions on how many key Cisco personnel are allowed on the same plane.